Senior Shanil Patel ran with an interception to score a touchdown. 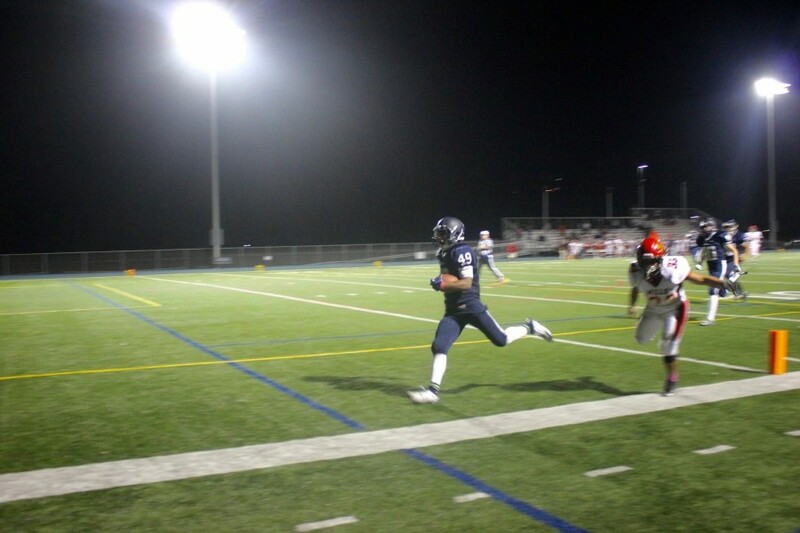 The varsity football team took a win on homecoming night against the Mills Vikings on Friday, Oct. 23. The Scots battled hard for their winning score of 28-6 on such an exciting night. The night started out well for the Scots with the quarterback running the ball and no calls on Carlmont, running back senior Jake Kumamoto managed to take the first touchdown of the night for the Scots. A penalty of offside on the Vikings allowed the Scots to move closer to the field goal for the extra point. “Once the first touchdown was scored, you could feel a good rush of confidence in the boys. They immediately got a rush of energy as did the audience,” said team manager sophomore Noelani Edwards. As we went into the second half of the game, tension began to rise from both teams. Six players on the Vikings were injured due to plays and contact which led to some altercations on the field. Arguments on the field also affected the Scots by having four players ejected from the game. “Seeing some of my teammates getting ejected made me more aggressive for the rest of the game,” said linebacker sophomore Jason Lloyd. After the Vikings running back managed to score a touchdown, safety senior Steven Palthe on the Scots blocked the kick preventing the field goal and the extra point. “It was really exciting to get the whole team hyped up,” said Palthe. As the game was coming to an end, the Scots scored a total of four touchdowns, one from senior Shanil Patel catching an interception that made the crowd go wild. The Scots celebrated their homecoming night with a win. “It felt satisfying and thrilling to win especially since it was homecoming,” said Lloyd.